Engineering—designing and constructing roads for bicyclists and pedestrians. Education—teaching or training bicyclists, pedestrians, motorists, and other road users. Enforcement—ensuring that all road users follow traffic laws and rules of the road. Encouragement—providing incentives beyond physical infrastructure. Evaluation—confirming that the intended outcomes have been produced. Historically, providing for bicyclists meant providing bicycle facilities. This was the focus during the early phase of program development in the United States. By the late 1970s, some progressive communities such as Boulder, CO, and Madison, WI, replaced that focus with a more comprehensive 4E approach that combined engineering and planning with enforcement, education, and encouragement (see figure 24-1). By then, it had become clear that simply providing a bicycle- and pedestrian-friendly road or trail environment, as important as it is, cannot solve all bicycle and pedestrian problems. Some safety problems, for example, may be more easily solved through programs than through facilities. In order to understand the importance of the other elements of a comprehensive program, consider the following two examples. Figure 24-1. Photo. Comprehensive bicycle and pedestrian programs include more than bike lanes and sidewalks. A person decides to ride her bicycle to work. Between home and the office, she rides a road with bicycle-friendly design features (e.g., wide outside lanes, bicycle lanes, etc.). While riding, she barely misses a 10-year-old wrong-way rider coming at her, is almost cut off by a motorist turning left in front of her, and finally finds no place to securely park her bicycle at the office. She locks her bike to the leg of a newspaper rack and goes into the office. When she leaves work, the sun has gone down; she has no bike lights. She calls a taxi to take her and her bicycle home. While she was able to take advantage of one element of a comprehensive program (the on-road facilities), the lack of other elements caused her serious inconvenience and danger. Youngsters need to learn which side of the road to use, and the traffic laws should be enforced; motorists should learn to watch for bicyclists and to yield to them just as they would to other motorists. Common bicyclist and motorist errors that lead to many crashes can be addressed through education, enforcement, and awareness programs. Secure and convenient bicycle parking should be provided at all popular destinations as a routine matter. In some communities, this is dealt with in the parking ordinance. A person gets in his car on a sunny summer afternoon to drive to a nearby store. The store is less than 1 km (0.6 mi) away, and he is buying a quart of milk. There are sidewalks, but he doesn’t even think of walking. He drives there, buys his milk, and drives home. While the existence of sidewalks or places to walk is important, it does not necessarily convince people to walk if they habitually take a car for every trip. The average American household generates 10 auto trips per day, many of them short-distance errands. Breaking the driving habit requires effort and understanding. A good awareness campaign, including media spots and other elements, can help develop that understanding and encourage people to make the effort to walk for short trips. Walking takes little extra time compared to driving for very short distances. When one considers the costs (environmental, economic, personal health) of driving and the exercise and health benefits of walking, walking is often preferable. These two hypothetical examples point out the importance of going beyond the earlier focus on facilities alone to include other aspects as well. They suggest the potential roles that agencies such as the police department, the school district, and private parties such as the local television station and newspaper can play in improving the bicycling and walking situation in a community. It is important to keep in mind that some elements may not contribute directly to an increase in numbers of nonmotorized travelers. However, these elements are important for other reasons, primarily safety. How, exactly, can an effective mix of engineering, enforcement, education, and encouragement be determined? The answer is that participants from a wide range of agencies and groups must get involved in the process. The Geelong, Australia, model is a good one to illustrate this point. The Geelong Bike Plan Team included members from the enforcement community, roads department, safety agencies, school system, and bicycling community (see figure 24-2). 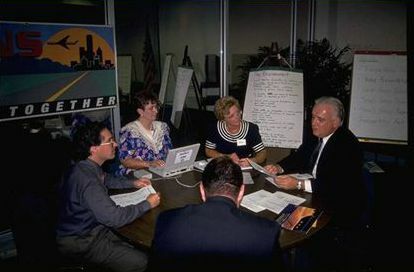 In assembling their comprehensive program, the project managers enlisted the help of those who would, ultimately, be responsible for implementing it. Figure 24-2. Photo. Comprehensive bicycle and pedestrian programs bring together a variety of stakeholders. Because so little is known about the bicycling and walking situations in most communities, it is difficult to predict in advance what level of expenditure and program activity will be needed to implement a comprehensive program. Until the needs have been identified and the problems assessed, the necessary scope of the program will probably remain unknown. However, the basic approach suggested here is to make bicycle and pedestrian considerations part of the normal process of governing. In many cases, this may require little extra expense. For example, if a police officer stops a bicyclist for running a red light, this should not be seen as a new or extra duty. It is simply part of traffic enforcement and it will pay the community back in terms of decreased crash rates. Similarly, adding pedestrian- or bicycle-related questions to a transportation needs survey will not necessarily require large amounts of money. It allows transportation planners to do a better job of planning for the community’s travel needs and can pay off in reduced motorized travel demand. Finally, changing a dangerous drainage grate standard to a bicycle-safe design costs no more, but can reduce an agency’s potential liability. There will be some projects (e.g., a new bicycle bridge) that require a significant expenditure of funds. However, if the need for a project is clearly documented through surveys and studies, it can take its place in the TIP. In such an arena, its strengths and weaknesses can be weighed against those of other potential projects. There are four primary steps in the process of mixing the elements of engineering, education, enforcement, and encouragement to create a comprehensive bicycle and pedestrian program. First, it is important to develop an understanding of the local bicycling and walking situations. This means looking closely at nonmotorized travel in the community to determine its limitations and potential, as well as current levels of use and safety problems. This understanding will form the basis for the work that follows. The second step is to set realistic goals and objectives. These should be based on data from the information-gathering step, and they should be measurable and achievable. Third, participants should address those goals and objectives through the development of an action plan. The plan should be a blueprint for the community’s work in all the elements of the comprehensive program. It should include phasing and funding considerations. Fourth, as work on the action plan progresses, it should be evaluated based on its effects on the goals and objectives. Without an evaluation process, it is impossible to determine the effects of one’s work. With evaluation, one can judge and document success, correct errors, and fine-tune the program. Approach: Using information gathered from the user studies as well as the crash studies, work with school administrators and teachers to identify target ages for key educational messages. Review course options and identify opportunities for implementing bicycling and walking curricula for the target ages (see figure 24-3). Result: A program of instruction that effectively reaches the target audience. Examples: The Missoula, MT, school district has included bicyclist education in its core curriculum since 1980; the program is taught by physical education instructors. The Boulder, CO, bicycle-pedestrian program staff includes a full-time education person in charge of implementing curricula in cooperation with the local school system. The Madison, WI, program works with local schools to do the same. Approach: Using information gathered from the user studies as well as the crash studies, work with college and high school administrators and teachers to identify key educational messages. Review course options and identify opportunities for implementing bicycling and walking curricula for the target ages. Examples: Effective cycling instructors in Seattle, WA, Tucson, AZ, and other communities have offered adult courses through the local junior colleges. Missoula, MT, and several other communities have offered cycling classes to traffic-law violators through the local municipal court systems. Approach: Using information from the crash studies, work with local driver training instructors and violators to identify key messages for delivery to new drivers, as well as those required to take remedial driving courses. Assemble a model curriculum unit and deliver it to all local instructors. Result: A model curriculum and delivery mechanism for reaching drivers during training. Examples: The Gainesville, FL, bicycle coordinator taught 14- and 15-year-old driver education students how to share the road with bicycles. The coordinator brought copies of bicycle/automobile crash reports to illustrate her points. She then divided the class into groups, each with a crash report. Groups analyzed how the crashes happened and how they could have been avoided. Approach: Using information gathered from the crash studies, identify important messages for the whole range of target audiences (see figure 24-4). Result: A prioritized list of messages identified as to their target audiences. Examples: The Gainesville, FL, program determined that one of the audiences most in need of attention was the college student population. Key safety messages for these bicyclists were identified. Figure 24-4. Photo. Target safety messages to key audiences through various media. Approach: Work with the local media and other groups to determine the best way to reach the audiences identified above, given the resources available. Result: A long-term strategy for delivering selected messages to key target audiences. Examples: In 1986, working with local bicycling groups and the media, the Madison, WI, bicycle program created an ambitious bicycle helmet campaign. They did before-and-after studies of both helmet wearing rates and their success in delivering their messages. In Gainesville, FL, officials commissioned a safety specialist to create college student-oriented bicycling comic strips for publication in the campus newspaper and for printing as brochures. Figure 24-5. Photo. 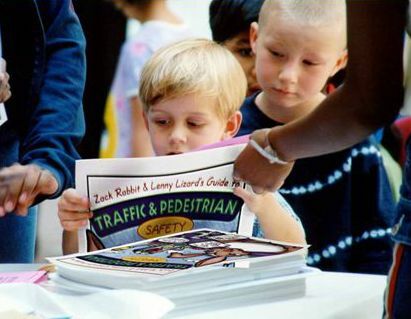 The NHTSA Resource Guide can be used to improve existing traffic laws. Approach: In cooperation with the police department and city attorney, review local and State bicycle and pedestrian laws and compare with the current version of the Uniform Vehicle Code and Model Traffic Ordinance (see http://www.ncutlo.org/ for more information). Focus on those regulations that may unnecessarily restrict bicycle or pedestrian traffic or that seem out of date when compared to the national models. Result: A report listing suggested changes to local and State traffic laws. Examples: Palo Alto, CA, after reviewing potential crash problems and liability concerns, decided to allow bicycle traffic on a key expressway. In doing so, they opened a new route for fast crosstown travel. Approach: Using information from the crash studies, determine which traffic violations are implicated in the most common serious car/bike and car/pedestrian crashes. Work with the police department, traffic court, and city attorney to develop a plan for enforcing the key laws. Result: A plan for equitable enforcement of bicycle, pedestrian, and motor vehicle traffic laws. 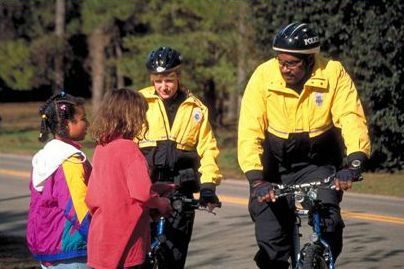 Examples: Since the mid-1980s, the Madison, WI, police department has staffed a bicycle monitor program with specially deputized university students to enforce bicycle traffic laws. The Seattle, WA, police department aggressively polices crosswalks and routinely tickets motorists for violating pedestrian rights-of-way. The Missoula, MT, bicycle patrol routinely tickets motorists who violate the law. Approach: In cooperation with the police department, develop procedures for handling young bicycle and pedestrian law violators. Result: A set of procedures for dealing with young bicyclists and pedestrians. Examples: For years, Dallas, TX, operated a youth court for young bicyclists caught violating traffic laws. The City of Santa Barbara, CA, a pioneer in bicycle enforcement, developed a campaign that included special tickets for youngsters, a publicity campaign, and a training film for officers. Missoula, MT, has a special warning ticket for youngsters: one copy goes to the violator, one is mailed to the parents, and one is kept at the police station. Approach: Based on the police department’s bike theft study, develop a strategy for reducing the impact of bike theft rings and other sophisticated thieves. Also consider a means to inform the public of simple steps they can take to keep their bikes from being stolen. Result: A plan for reducing bike theft in the community. Examples: Missoula, MT, used their 1982 bicycle theft study as the basis for TV spots, appearances on news shows, news releases, brochures, and posters, all of which promoted using high-security locks. They also developed a computerized bicycle registration procedure that has helped identify and return many licensed bikes to their owners. Approach: Based on the study of bicyclist and pedestrian harassment and assault, develop a standard procedure for dealing seriously with these complaints. Result: Policies and procedures for dealing with bicyclist and pedestrian assault and harassment. Examples: For years, the Missoula, MT, bicycle program has worked with the city attorney’s office on a case-by-case basis to resolve complaints of bicyclist harassment. Their efforts resulted in irresponsible motorists receiving numerous warnings and citations. Approach: Based on the experiences of other communities, determine the need and potential of nonmotorized patrols in the community and develop an implementation plan. Result: A plan for funding and creating nonmotorized police patrols in the community. Examples: Seattle, WA, has pioneered the mountain bike patrol as a way of dealing with street crime. Begun in 1987, the patrol has grown to more than 100 officers, and the founders have given training seminars to police departments all over the country (see figure 24-6). Each year, hundreds of mountain bike officers gather for a national conference sponsored by the League of American Bicyclists; many also attend the annual Beat the Streets patrol competition hosted by that city. Figure 24-6. Photo. Police bicycle patrols are effective at outreach and crime prevention. Approach: Identify all agency motor pools and determine which can be modified to include bicycles. In addition, consider which trips can be efficiently taken on foot. Create a plan of action for adding nonmotorized options where possible. Promote the approach as a model for other local employment centers. Result: A plan for using nonmotorized modes in satisfying agency transportation needs. Examples: The City of Seattle, WA, recently created a nonmotorized pool, adding bicycles to the motor vehicles available for employee use. The bikes are proving to be extremely popular. Approach: Review city policies and practices, as well as those of private companies and other large employers, that reward driving private automobiles or discourage walking or bicycling. Work with all appropriate agencies and companies to modify those provisions. Result: A set of proposed options (policies, ordinances, programs) that address institutional biases against bicycling and walking. Examples: In Palo Alto, CA, a transportation plan for Stanford University suggested helping staff purchase bicycles if they would use them for commuting to work. The City reimburses those who use their bicycles for work-related trips. The university campus in Davis, CA, has for many years severely restricted motor vehicle parking. This has been identified as one of the major factors in encouraging students and faculty to ride bikes to the campus. Approach: Identify existing programs or groups that could become sponsors for introductory-level bicycling and walking activities. Based on user studies, create a list of potential activities and match them with groups willing to offer sponsorship. Result: A schedule of introductory-level nonmotorized recreational activities. Examples: The Eugene, OR, recreation department sponsored a variety of recreational rides and workshops for novice adult riders through their network of parks. The Chesterfield County Parks Department in Richmond, VA, sponsors an annual Peanut Ride, which visits peanut farms in the area, allowing participants to learn more about local agriculture while getting exercise. Approach: Through a combination of promotional events and media publicity, encourage citizens to walk or ride in place of driving. Result: An annual series of promotions supporting nonmotorized travel. Examples: The Boulder, CO, annual Bike Week has become a major event over the years, encompassing a schedule of senior citizen rides, bike polo, business challenges, bicycle parades, and nonpolluter commuter races. During that city’s Bike to Work Day in 1992, approximately 7,000 people rode bicycles to work. Approach: Based on the user studies, determine which audiences are most likely to bicycle or walk, further determine their detailed informational needs, and create a plan for getting that information to the target audience. Result: A plan for giving detailed useful information to key target audiences. Examples: The Ann Arbor, MI, program has run seminars at local hospitals and other employment centers, helping participants learn how commuting by bicycle might work for them. In Los Angeles, CA, the El Segundo Employers Association, in cooperation with the Southern California Association of Governments, has produced maps, pamphlets, and seminars to promote nonmotorized transportation among their workers. Approach: Based on the user studies, determine the educational needs of bicyclists and walkers, assemble a list of the most important messages, and create a media campaign to get them across. Include the experiences of current nonmotorized travelers as a way of personalizing the messages and lending added credibility. Result: A media campaign promoting the benefits of bicycling and walking directed at key target audiences (see figure 24-7 for an example). 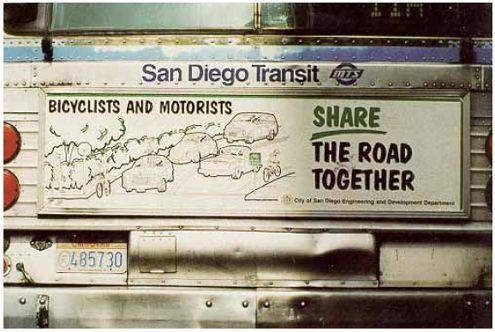 Examples: San Diego, CA, has used bus-mounted advertising to promote the benefits of nonmotorized travel. Seattle, WA, in cooperation with a local television station, has created a series of local promotional television spots. Figure 24-7. Photos. Vehicle license plates that promote sharing the road with bicyclists. A comprehensive bicycle and pedestrian program directed toward the goal of increasing safe travel by nonmotorized modes must combine the efforts of many people. No one office can do it all. Officials in public works, planning, enforcement, education, and recreation agencies all have a role and must work together to achieve the desired end. In order to measure future success, it is important to first determine current conditions. Since nonmotorized travel is so seldom measured, we know little about it. With data on use, user attitudes and behavior, safety, and security problems, it is possible to begin assembling an achievable set of goals and objectives. These goals and objectives should be used to guide the development and implementation of an action plan. The plan should include physical elements such as roadway improvements and trail systems, as well as nonphysical elements such as enforcement and educational programs. Evaluating the elements of the action plan is a critical step in determining future direction and past success. Success should be measured in terms of both services delivered and effects achieved. Evaluation must be seen as a key ingredient to implementation, rather than as an extra duty to be performed if there is time or money. Combining these steps into a comprehensive program will allow a community to achieve and measure success. Volunteer at a bicycle or pedestrian education event. Identify the organization, group, or committee that deals with engineering, education, and enforcement in the local area. If there is a group, sit in on a meeting and see what activities and issues there are in the community and how the class might help or participate as part of a class project. Identify the education and enforcement activities in your community and critique and compare the elements in your community with the examples in the lessons. Work with public officials on how to make revisions to the programs and/or policies. "Case Study No. 11: Balancing Engineering, Education, Law Enforcement, and Encouragement," National Bicycling and Walking Study, Publication No. FHWA-PD-93-009, FHWA, Washington, DC, 1994. Image Library, PBIC, available online at http://www.pedbikeimages.org, accessed May 6, 2004. 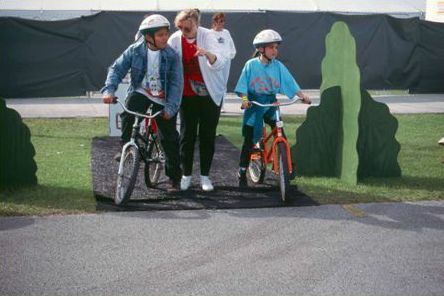 Good Practices Guide for Bicycle Safety Education, FHWA, Publication No. FHWA-SA-02-001, available online at http://www.bicyclinginfo.org/ee/bestguidedoc.html, accessed May 3, 2004. 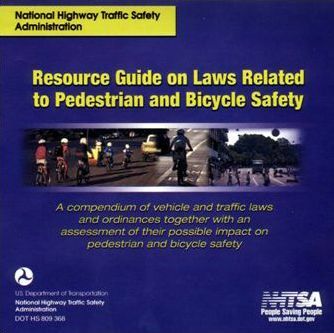 Resource Guide on Laws Related to Pedestrian and Bicycle Safety, NHTSA, Publication No. DOT-HS-809-368, available online at http://www.nhtsa.dot.gov/people/injury/pedbimot/bike/resourceguide/, accessed May 4, 2004.